Here you go, a chance to win a huge box of very good festive themed Hotel Chocolat chocolates, because: Christmas. ‘The Christmas Wreath Box’ is described in the marketing as “a show-stopping festive centrepiece to gather round and share this Christmas. 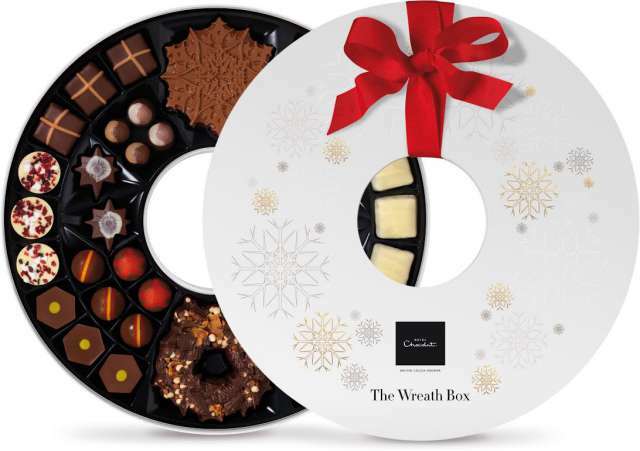 Filled with 43 delicious Christmas truffles, a chunky cookie wreath and two large chocolate snowflakes, one cast in salted caramel and the other in 85% dark”, and it is indeed quite impressive, and worth £42, but free to one lucky Interweb surfer! Hotel Chocolat have a place in Leeds, and have just moved their shop in York right into the heart of Stonegate. It seems fitting that York, which has a fairly impressive chocolate-steeped history itself, should be home to a Hotel Chocolat. Entering is easy – just fill in the form after the break below. The draw will close at midnight on Tuesday, 15th December, and the winner will be notified by email. Entries open to UK residents only. Sorry, rest of the world. Best of luck, and Happy Christmas. Wow it makes me hungry just looking at those lovely chocolates.